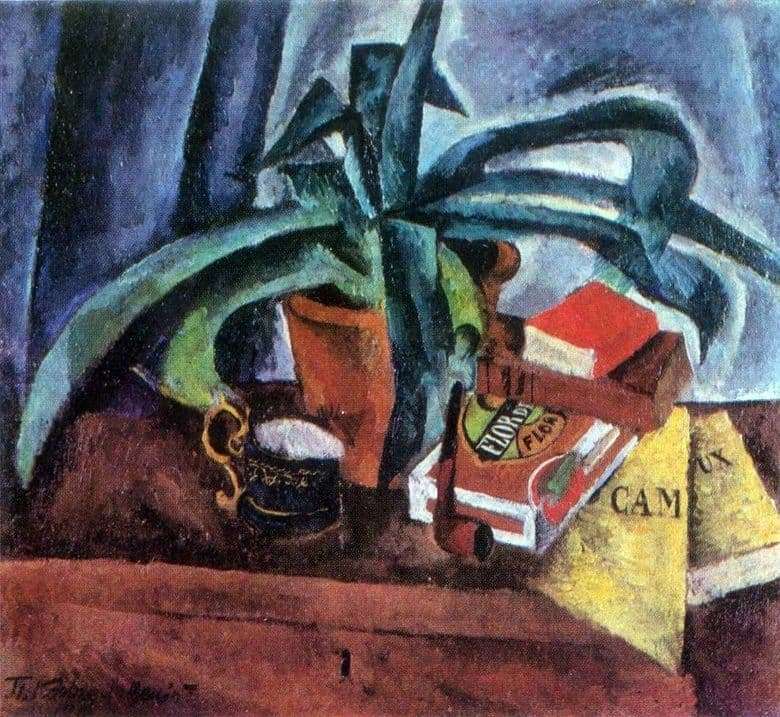 Still life “Agave”, contrary to the etude of implementation, is fully completed in a stylistic and meaningful way. The artist managed to show the real presence of a person through things. The texture of the canvas conveys the external qualities of the objects: paper, elastic, juicy leaves of the agave, texture to the specularity of polished wood. The use of the technique of semi-dry painting in combination with the glaze draws attention to the relief of the painting, which was worked out specifically for its design. The elaboration of colors and textures is the main task of the wizard, who chose a way to adapt color and image, believing that there is no need to repeat nature, but to find specific features in it and show them. Colors can also be divided into shades: for the expressiveness of an agave leaf, light green, dark green, emerald and yellow tones were used, which together create the impression of the plant’s richness, volume and glossiness of the leaves. The same method is applied to the image of a rich blue curtain and the plane of a wooden table top in brown and olive shades. The texture of the table and clay pot is superbly written, where chiaroscuro conveys the slightest roughness and unevenness. A striking red cover of a miniature book located on top of a brown folio, yellow pieces of paper, and a motley box set off the foliage of the flower, enlivening and highlighting it on the canvas. There are no random colors and textures on the canvas, everything is thought out and compositionally justified. The gilded shimmering handle of a monogram-shaped cup is exquisitely and elegantly written out. The artist delicately feels the quality of the color, the edges of the color spot: his paints correspond to the shape of objects, form it. Smears sometimes seem coarse, but in fact they correctly fit into the tone, in combination giving an idea of ​​the subject through the saturation of the color of the picture. The main feature of the still-life is the distortion and loss of form: the corner of the journal disappears, the plane of the tabletop is erased in the distance, the two sides of the flowerpot lose each other in the place of their separation by an agave leaf, their silhouette does not fit together. There is a deliberate violation of the spatial relationship of things, it seems that the tube seems to be glued to the box. It seems that the shape of objects does not interest the master, and he deals only with color. Later Konchalovsky abandoned this method of intentional deformation.